As with any Semitic language, Ge'ez verbs are the key to its repertoire of triliteral roots (i.e. השורש or الجذر.) I've compiled a glossary of verbs that contain frequently appearing roots, as an quick and easy reference for people starting out. You can scroll through the glossary here or you can download and print it, by clicking here: Roots Glossary. 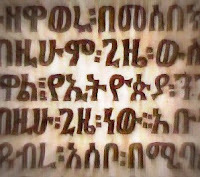 I have arranged the list in the traditional order of the Ethiopic alphabet, and included verb form, pronunciation, and Semitic cognates. To review the four forms of verbs (B - D - L - Q) and conjugations in the perfective (i.e. past tense), please refer to blog entries 10, 14 - 16. Please let me know of any edits / additions / subtractions / corrections! Thanks for an excellent resource. Arabic: حصّ = to diminish. Hebrew: חצץ = to divide. Most of them will have cognates, except for the ones which were borrowed from Cushitic languages. You can use my website (http://www.semiticroots.net) to look them up if you like, most of them should be in our database. If you goto the search tab, then use the Ge'ez converter tab to find out which radical indexes to search by, you should find entries for them, and be able to match them up to Hebrew & Arabic cognates. Great! Thanks -- I've just been relying on what I can think up -- this will definitely help pinpoint more cognates. Hope that helps. If there's any you don't find, let me know and I can check for them in various dictionaries and lexicons, and then I can also add them into Semitic Roots database at the same time.